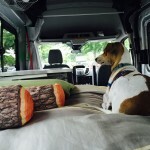 BACK STORY: Because of the greyhounds, in 2014 we transitioned from backpacking/tent camping to car camping with a pop-up tent trailer at state parks. 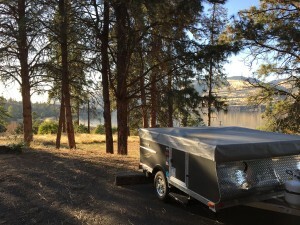 We enjoyed the Livin Lite Quicksilver 8.1 trailer— it was sleek, lightweight and had everything we wanted: beds, table with benches, a kitchen cabinet, stove top, sink, furnace and power. 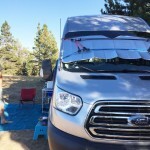 With it, we explored the Oregon coast campgrounds, and after discovering how easy it was to use the iPhone as a WiFi hotspot, we were able work from anywhere with a good internet AT&T data connection. The tent trailer gave us much more room than a heavy hard-sided camper. However, it had some major drawbacks. 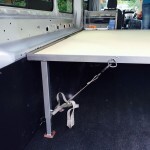 We couldn’t access anything in the trailer unless it was fully deployed. Using the sink and/or stove took up all available counter space. The dining table was usually in the way and we wound up just stacking gear on the benches. We found that we preferred to sit outside on camp chairs or, more often, just hang out on the bed. The furnace worked well but was also very loud. 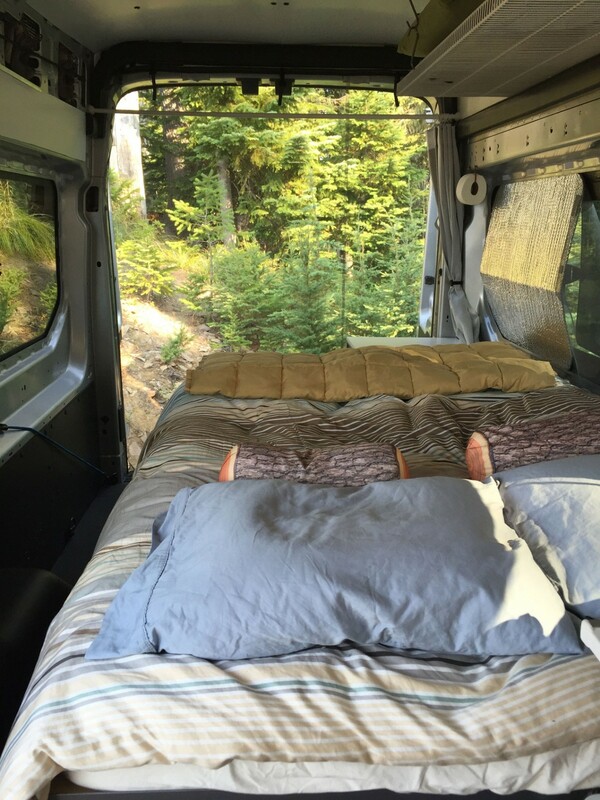 We agreed that we loved exploring Oregon in comfort but needed to make a change, especially in light of Chris’s retirement date of October 2015. 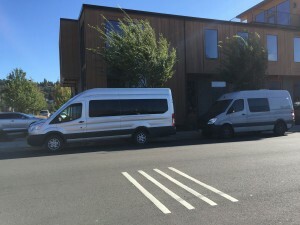 Attending the annual Fall RV dealer’s event in Portland was both astonishing and horrifying. Everything was SO big, and yet felt weirdly small inside and way too much like the tackiest apartment or hotel room. 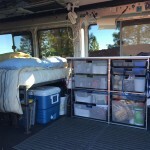 The Mercedes Sprinter-based Class B seemed like they might work, but were just too cramped with bathroom, plastic-y cabinets, microwave and multiple TVs and quickly became just as expensive as Class C motorhomes. “No more no less” than we need. 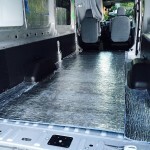 The Mercedes Sprinter platform is well established in the “adventure van” conversion community. But it’s expensive, has high maintenance costs because of its diesel-only engine and lacked the headroom David needed. Dodge’s ProMaster is not noted for its reliability, has too short a body length, a too-low roof and looks pretty homely. As luck would have it, Ford had just released their new Transit van which replaces their long-time Econoline series. Early reviews were very positive and it came with a gas engine that could be serviced by any Ford dealer. We stopped by our local dealership after spotting a high roof model on the lot. The interior volume looked promising, David could stand up with room to spare, and it handled surprisingly well on the road. 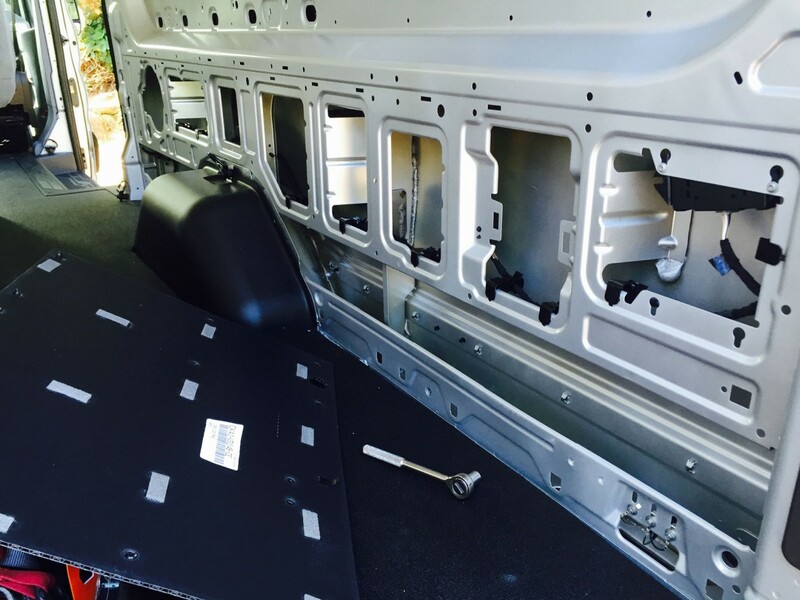 On April 15, 2015, we ordered an Ingot Silver Ford Transit F250 long wheelbase extended high roof cargo van 3.5L Ecoboost V6 engine with some upgrades ($43,000). It arrived in Sandy from Kansas City on July 22, and we were out for our first trip by August 6. THE CONVERSION: With only a couple of exceptions, noted below, we’ve done all the work ourselves. So far, we’ve spent just over $2100. 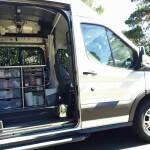 Our total investment so far is less than half the cost of the Sprinter conversion we admired at the RV show last fall. 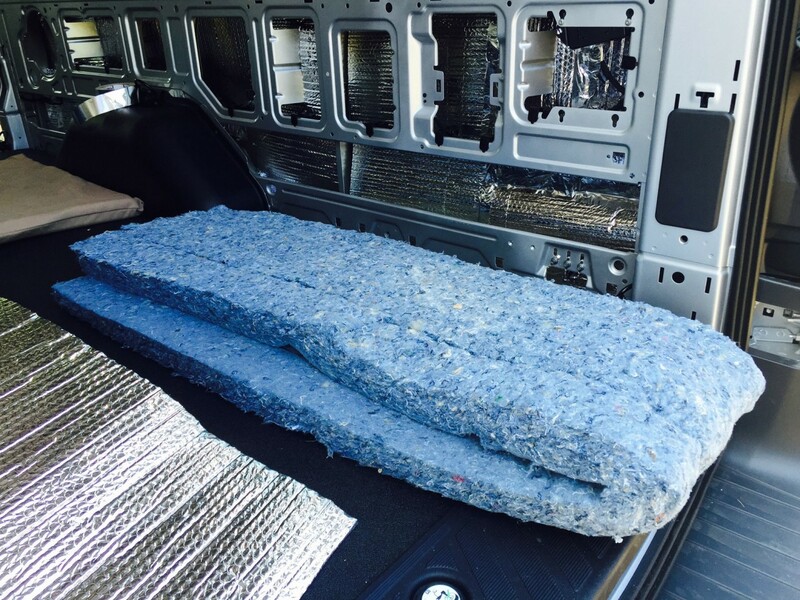 INSULATION: Ford’s cargo van comes straight from the factory with no insulation, headliner or wall panels. 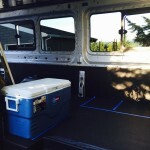 The floor is covered with a thick vinyl mat but it needed additional insulation and leveling. 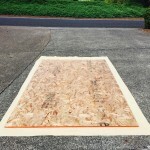 We slid a layer of UltraTouch Radiant Barrier under the mat. 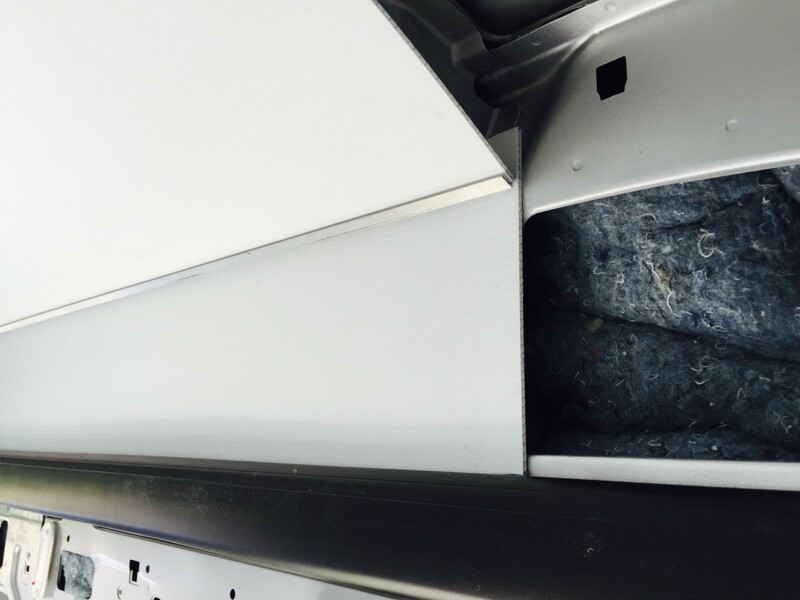 It’s a natural cotton product used for both acoustic and thermal insulation which we used in the ceiling areas, too. 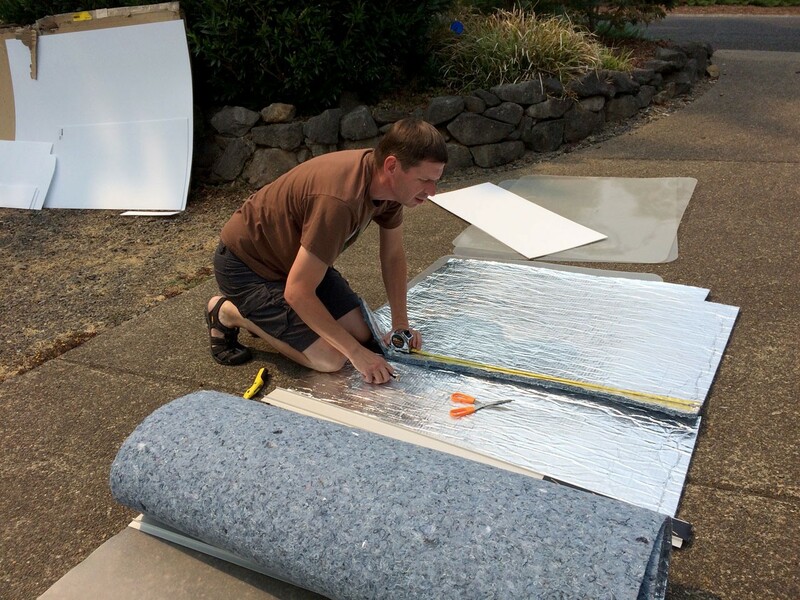 For the walls, first we lined the cavities with Reflectix, which look like reflective silver double-sided bubble wrap, then stuffed thick UltraTouch denim batt insulation into the voids. CEILING: David poured through the forums, blogs and Pinterest, looking at products and techniques to finish off the ceiling. 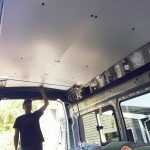 With limited time, money and skills, we thought we’d try a product we haven’t seen used for ceilings before: 8′ x 4′ sheets of white Coroplast, a thick plastic corrugated material similar to cardboard. It’s often used for outdoor signs. 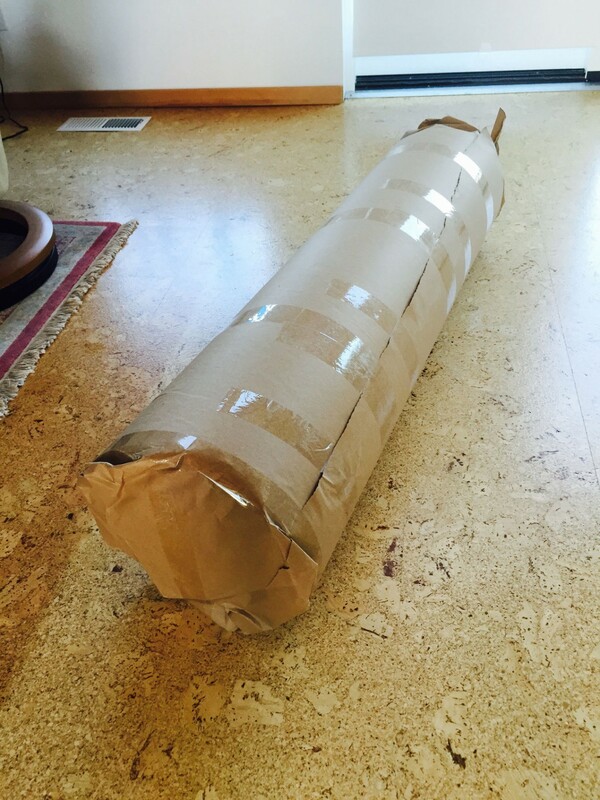 We special ordered it through HomeDepot (available in giant 10 sheet packs only). 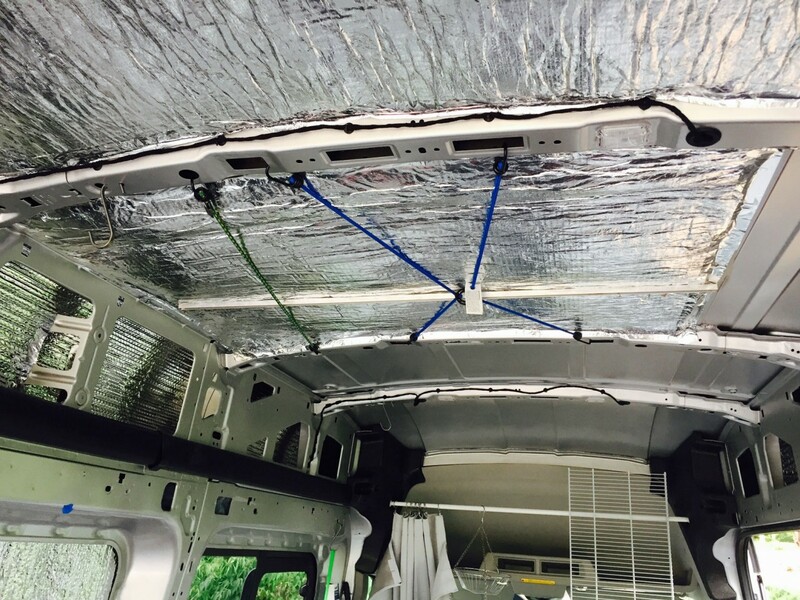 He attached it using thin strips of aluminum channel stock, Velcro and black push retainers. We love how it turned out— it’s lightweight, clean, bright and finishes off the ceiling nicely. 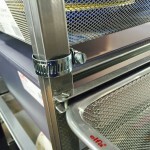 KITCHEN: The kitchen storage consists of two sets (medium and wide) of 4-runner Platinum Elfa frames stacked 29″ high from the Container Store. 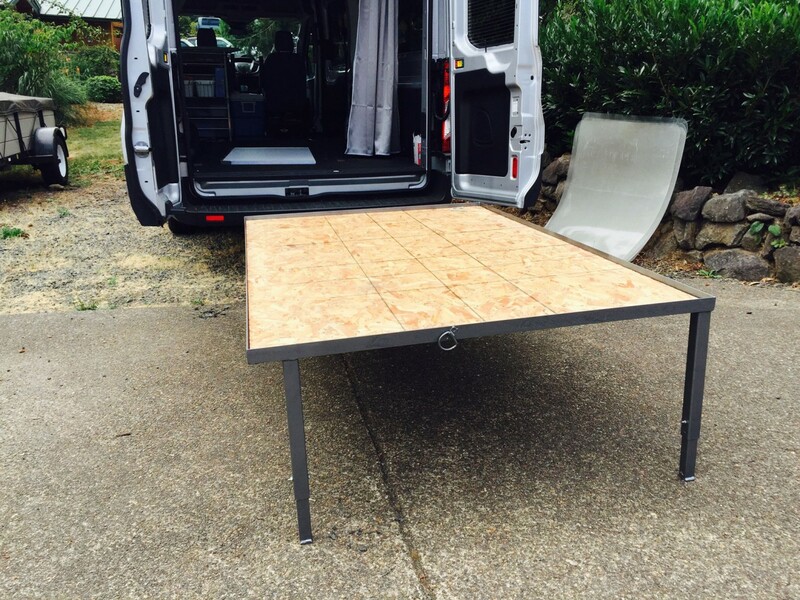 The counter top is a re-purposed Ikea desktop with an aluminum channel edge around three sides. 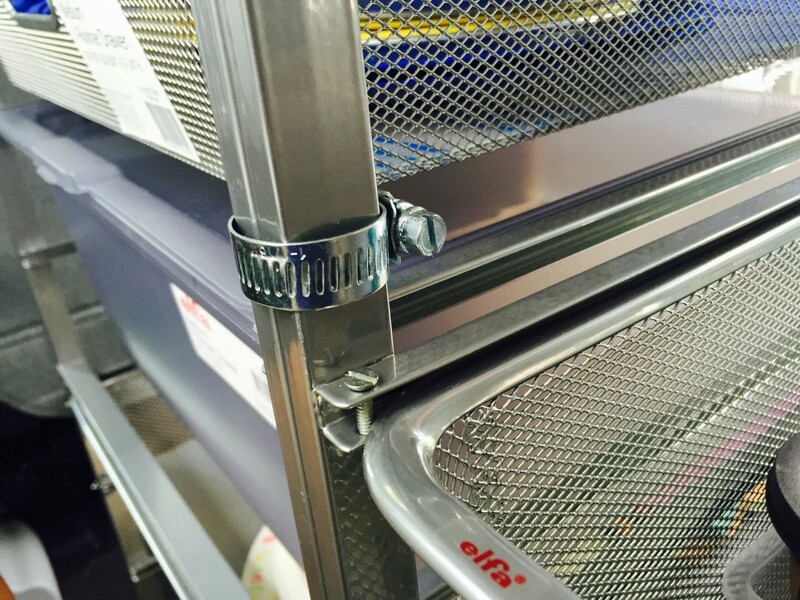 The sturdy Elfa system allows us a certain amount of flexibility in drawer size and placement. 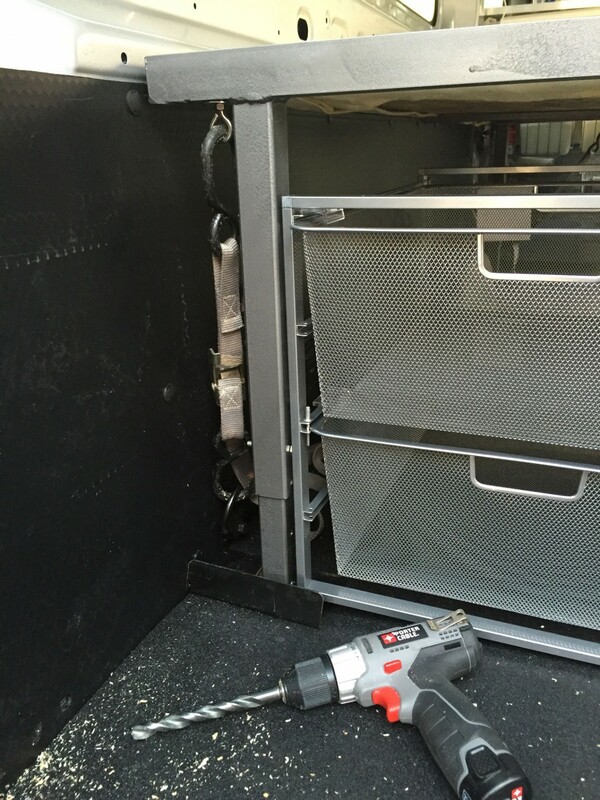 We use bungie cords to keep the drawers from sliding out in transit in addition to using rivet retention pins in the front corners of each drawer. BED: The bed represented the biggest conundrum of all. Should it fold? If so, where does the bedding stow? Should it run front to back or side to side? What size and type of mattress? How high off the floor? We even tested hammocks and considered bunk beds. Until the actual van arrived, we were still in the theoretical stage. 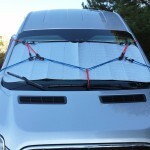 The night the Transit arrived, we inflated our Exped SynMat UL7 air mattresses and slept on the floor of the van. 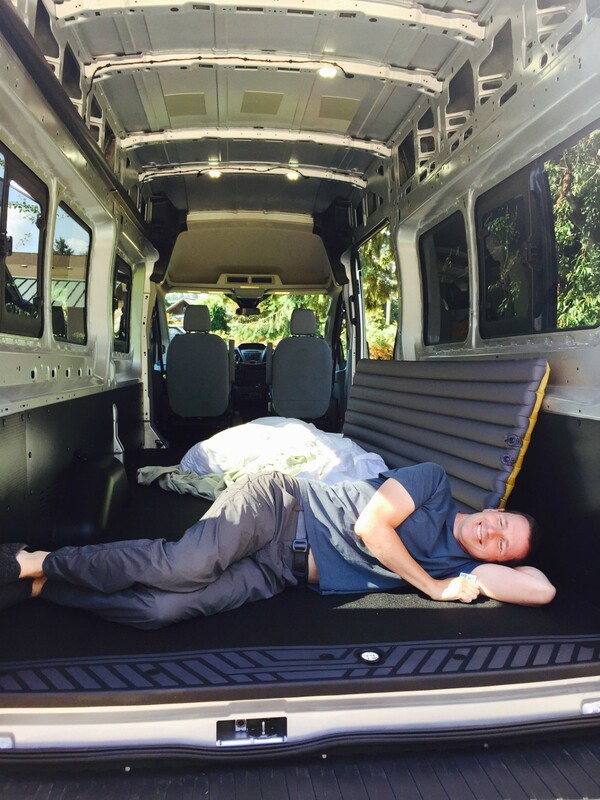 Clearly, at 6’2″, David would not fit sideways. All night long, we tracked exactly how much space we took up. 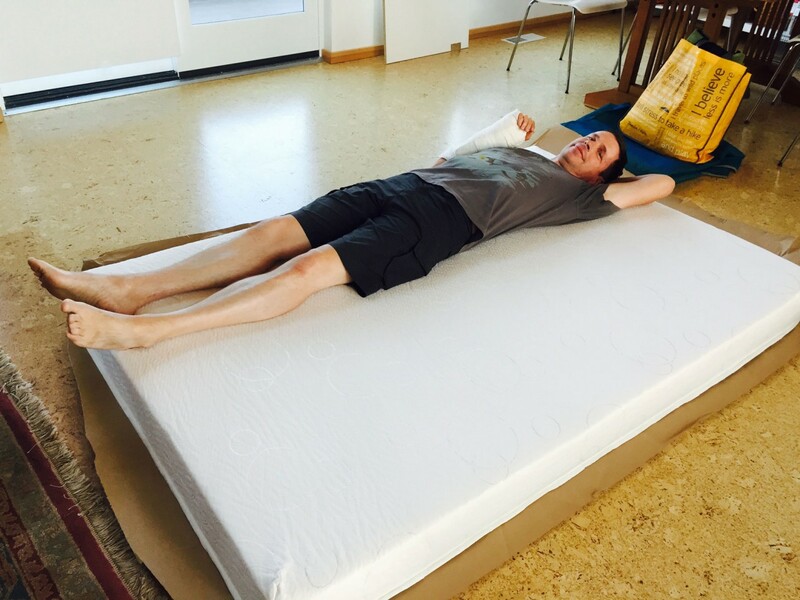 By morning, we concluded that a 48 x 75 inch mattress would suffice. 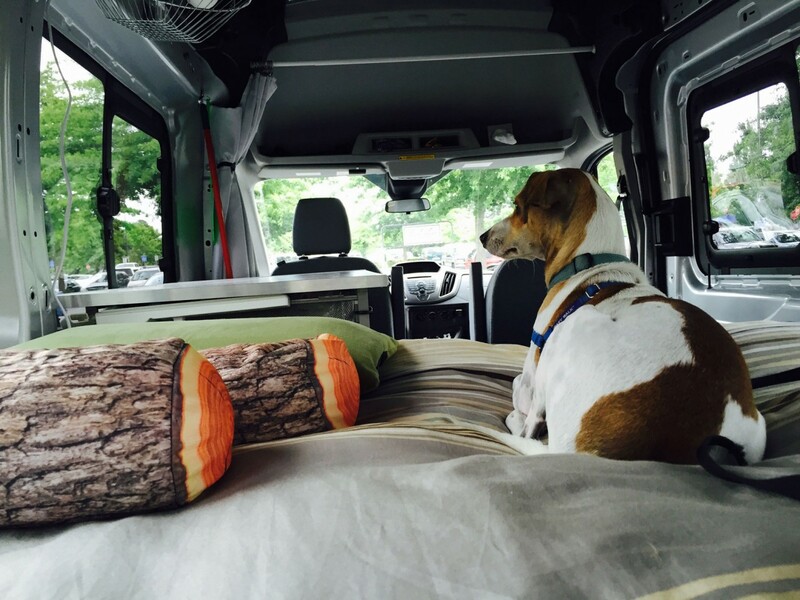 We located a brand that specializes in odd sizes for RVs and trucks and ordered the 3/4 size Sedona RV Mattress. It’s been great for snuggling under our winter weight down comforter and still allows plenty of room to walk along the side. There’s still room for two Downtube folding bikes in the rear. 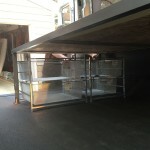 In the meantime, David’s stepdad Dave Walz swiftly and skillfully fabricated and painted a welded steel bed frame which adjusts to three heights: 16, 20 and 24 inches. 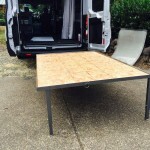 After adding a fabric-wrapped OSB panel and strapping it tight to the tie downs, we were all set. STORAGE: We liked the Elfa system we used for the kitchen so much that we returned to the Container store and picked up two 2-drawer units for our clothing, coats and gloves, etc. 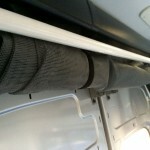 These are also fastened tightly together with plumber’s tape and anchored to the tie downs. We re-purposed two wire pannier market baskets from our road bikes to use for carrying shoes, maps and books. 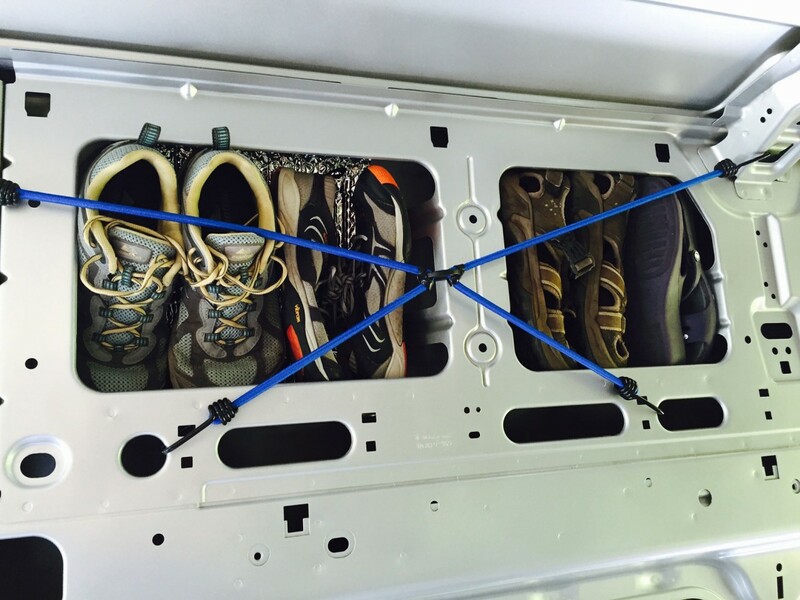 Hiking shoes/boots are stowed securely with bungies inside the wall cavities left open along the ceiling. 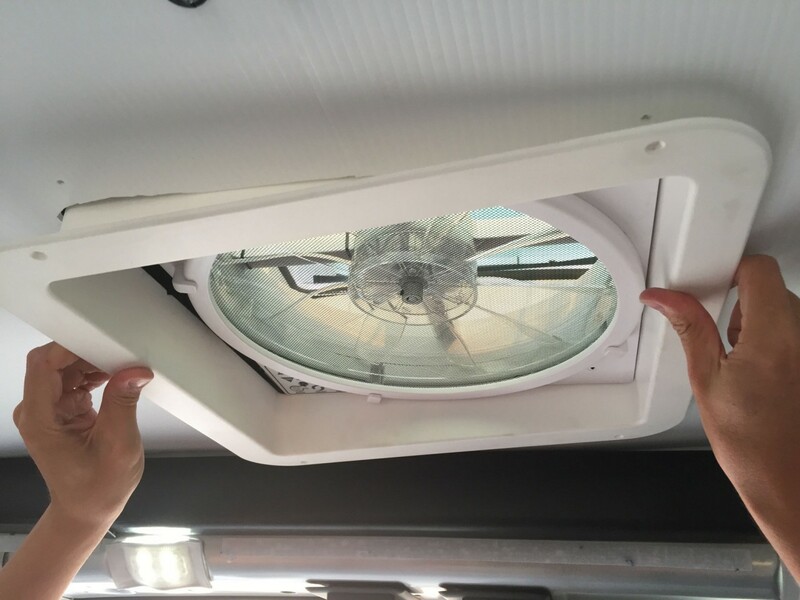 COOLING: The idea of cutting a hole in the roof was daunting, so we got Van Specialties in Tualatin to install a remote-controlled Maxxair Fan in the rear ceiling. 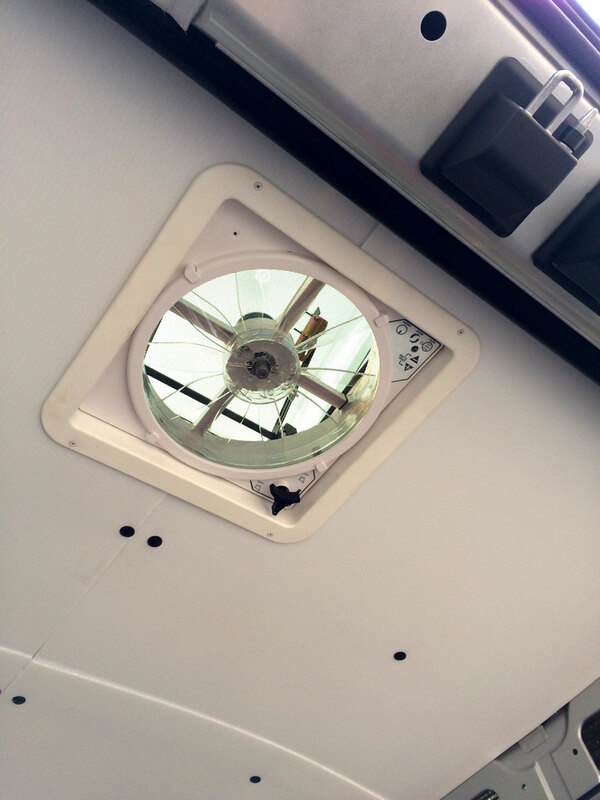 This allows hot air to exit passively when open, but also acts as an active cooling system when the fan is turned on. 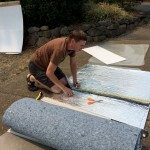 We cut pieces of Reflectix to block and reflect the solar gain through the windows. They can also serve as insulation on cold nights. HEATING: We’re still sussing out solutions for heating and solar ($1 to $5,000) and will update this post soon. REFRIGERATOR: Our Coleman Xtreme 75 quart cooler does a great job of keeping food cold for over 5 days. We freeze plastic containers of water ahead of time, and line the bottom of the cooler. It also does a fine job of providing seating if needed. An added bonus are the cup holders molded into the lid. 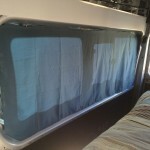 SCREENS and CURTAINS: Four of the side windows pop out a few inches, so Chris sewed screens made from fiberglass window screen fabric and attached them to the metal window frames with sticky-back Velcro. 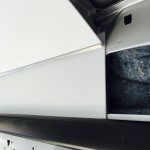 The screens for passenger and driver’s side windows take advantage of the door frames to hold them in place and are sewn from fine-gauge no-see-um fabric. 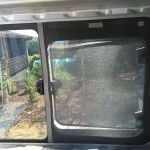 Velcro and magnets fasten the large 6 x 6 foot screens for the rear and sliding side doors, allowing us to sleep bug-free if they’re open at night. 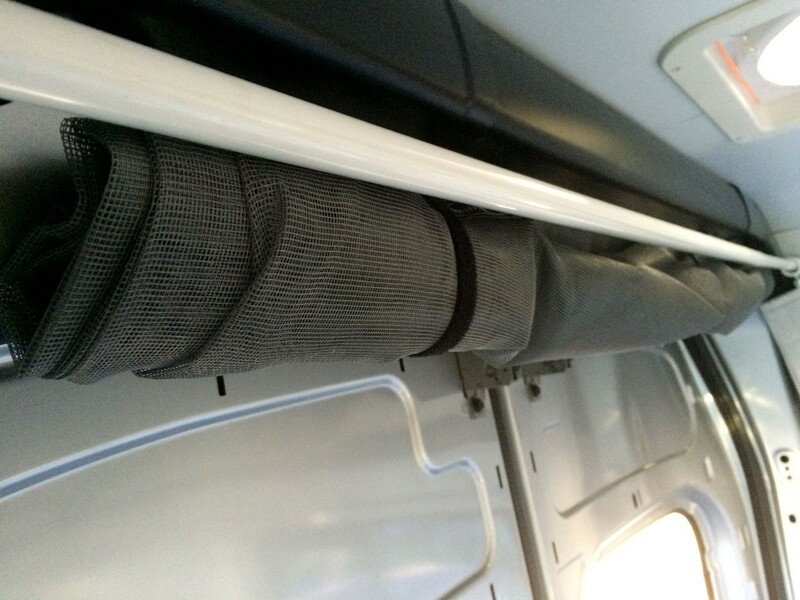 When not in use, they’re rolled up and secured with Velcro above the doors. Black-out curtains, rods and clips for added night-time privacy are all from Ikea. 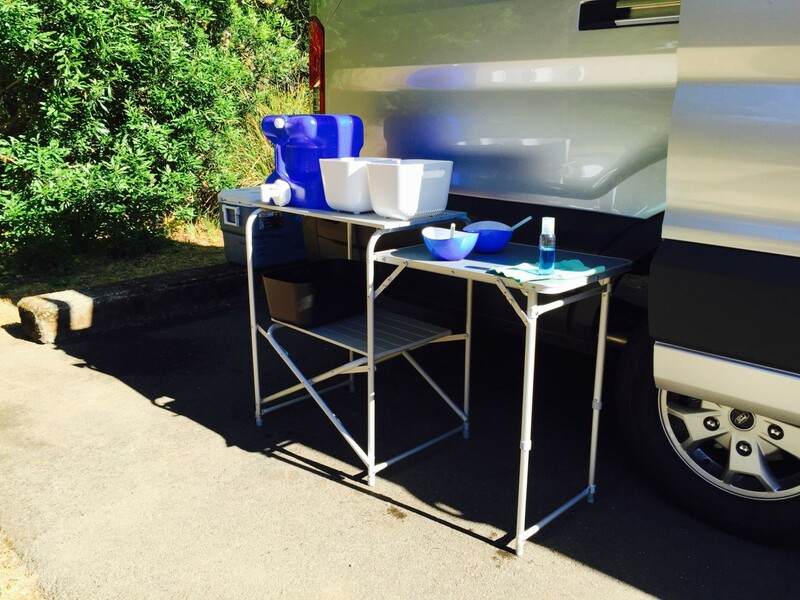 COOKING AND WASHING: It’s important to cook outside to avoid steam building up inside the van. This aluminum Mountain Summit roll top table from REI weighs less than 10 lbs and folds down into its own bag. After using the double burner Coleman stove for a few trips, we’ve switched to back to our small single-burner Primus stove which has a much smaller footprint. Once we’re done cooking, the dish pans, water jug and Nemo Helio Pressure Shower (thank you, Kevin!) 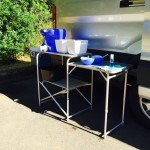 are set up for washing. We’ll fill the Helio with hot water for our showers when we go to the southwest next month. THE HEAD: Originally, we researched composting toilets, but they take up a lot of room and start at $500. Instead, we decided to make do with a more affordable option: a five gallon bucket, lined with 2 plastic bags holding 4 inches of kitty litter. As in the clumping kind. Snap on a toilet seat/lid combo with gasket, and for $20, we’re ready to “go”. So far, we haven’t had to use it, but it’s comforting to know the option is there, should the need arise. 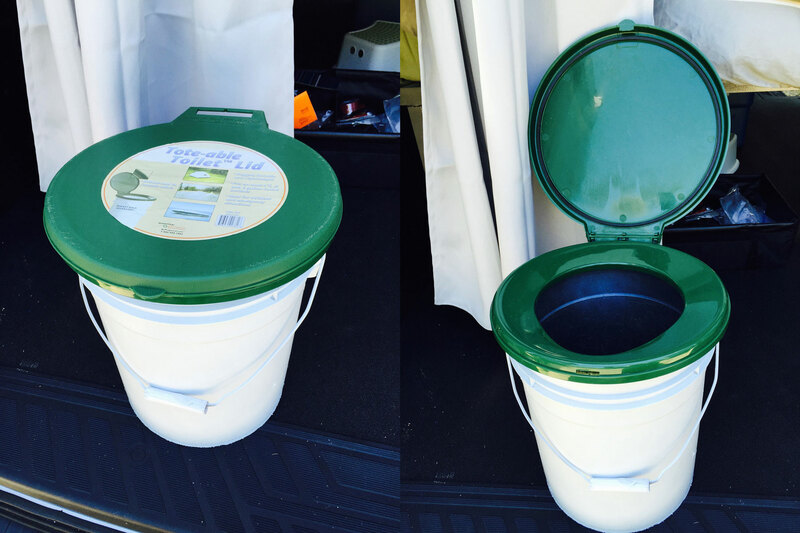 We’ve heard that dispersed campers in Utah have to pay a hefty fine unless they carry a functioning toilet. NAME: We get a kick out of the aggressive model names used in the RV industry. We’ve still debating the perfect name for our new rig: “Ultimate Platinum Renegade Vortex Scorpion Rendezvous, the Eco Edition” would have us fit in with the big guys, don’t you think? Just gotta get out that Bookman Swash font and we’ll be ready to rock. We’ve really enjoyed the design and build-out process so far. 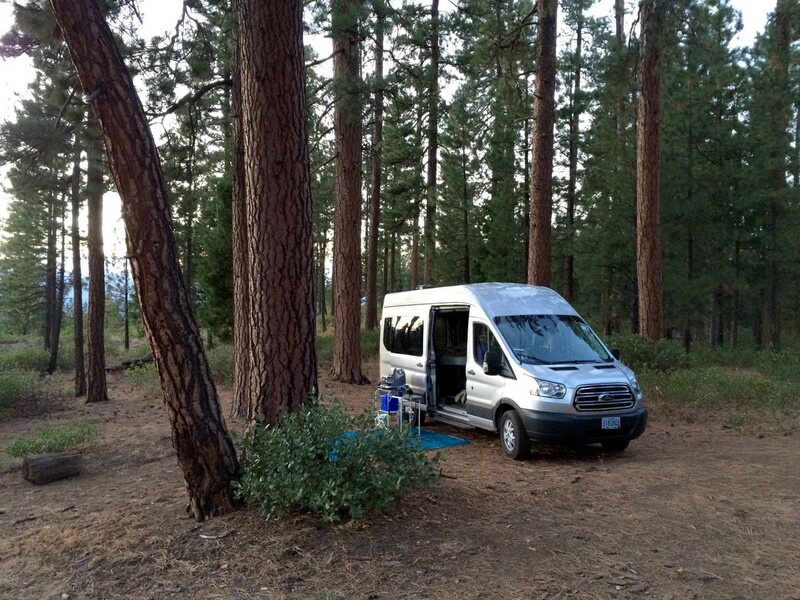 Our compact silver “spaceship” has been a delight to drive and live in (16 nights and 2500 miles as of September 15). We head south towards Arizona in October, so join us via the Beyond blog for more adventures! This is so awesome. You’re always miles ahead of me. Can we come see it when you’re back from your southwest adventures? Have fun and safe travels. I can’t wait to follow your future adventures! ‘Looking forward to your great story-telling posts. Looks Great! I love that you done 99% of it on your own. What concerns me it that I travel for a living and I change climates quite frequently. I’ve had some experience in the past with the inside metal walls sweating between the insulation and metal skin. I’ve never used this type of insulation but others that I’ve tried actually started molding from the condensation. 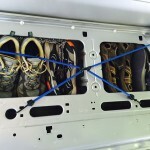 Is this the first time you’ve done this in a van and have you run into this kind of problem? 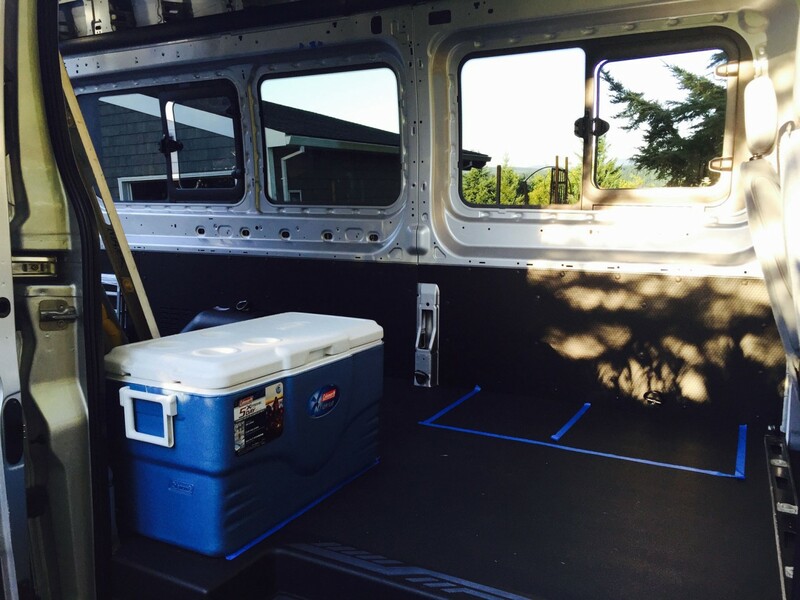 This is our first conversion, and we’re figuring it out as we go! LOTS, and LOTS of opinions and approaches to insulation. This method seemed pretty straight-forward and easily reversed if it didn’t work out. We plan to re-configure things this spring and will pull the ceiling panels and check for moisture. In the mean-time, we avoid introducing any more than we have to (vent open all the time and cooking outside unless it’s too windy!). Thanks for sharing your ideas and hard work. I’m making my own DIY Ford van. Looking forward to your future adventures. You have inspired a mature 68 year old dude and his chick. She want let me have another VW bus since helping swap blown engine in the snow in mid ’70s. Just got a Transit cargo van and thank you and the miss for jump starting on getting on the road. The journey is what it is all about, the technical, is just that. Space in time. 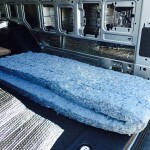 Cool, I’m stealing all your ideas on the insulation and especially the headliner. I am a klutz and with 10 4×8 pieces from Home Depot and can screw up a couple times on the headliner. 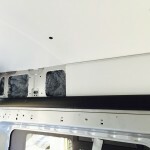 My Transit was the cargo and came with the black walls that look like the same material as your headliner. Oddly Home Depot wants twice as much for the black as the white. So I think I’ll end up with a white ceiling and black walls. 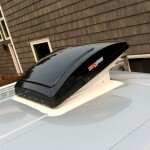 I’m also not going to cut any holes in my roof so I have to look for a vent installer in San Diego. I’m curious on why you went lengthways on the ceiling panels instead of going across. I would have thought it would have been easier cutting them to fit the other way. 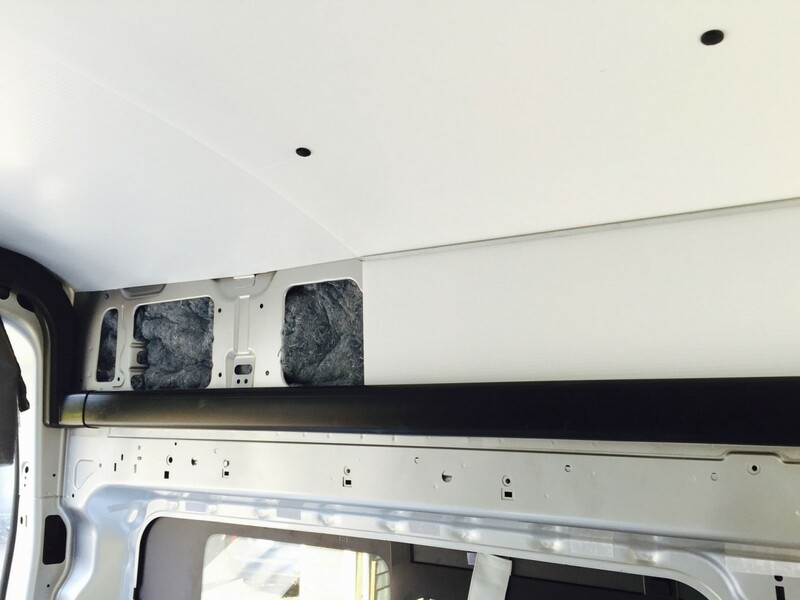 The white color makes the van feel more spacious and airy. 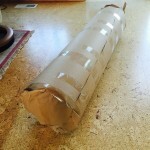 Coroplast only flexes in one direction (across the 4 foot dimension, not the 8′), so it worked better to go lengthwise. Found the little black retainer buttons on Amazon, they worked well. 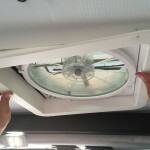 We had a local shop, Van Specialties, do our fan install (I didn’t feel confident about cutting a hole in our van either!). 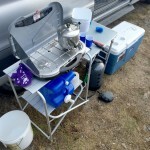 Love the Maxxair, we’ve only needed to run it a couple of times, mostly just keep it open all the time for ventilation. It is great to see Coroplast in action before I start my build. Thanks! FYI, Coroplast with the channels facing the short direction is also available. I plan to use it cross ways on my ceiling. Unfortunately, that may mean that I need both long way and short way channels if I use Coroplast on the walls. And that means that one pack of 10 sheets won’t do it all. Since the wall panels will be covered and the walls don’t curve as much as the ceiling I may try to use the cross-channel sheets on the walls. I am also planning to use the plastic push pins to install it. 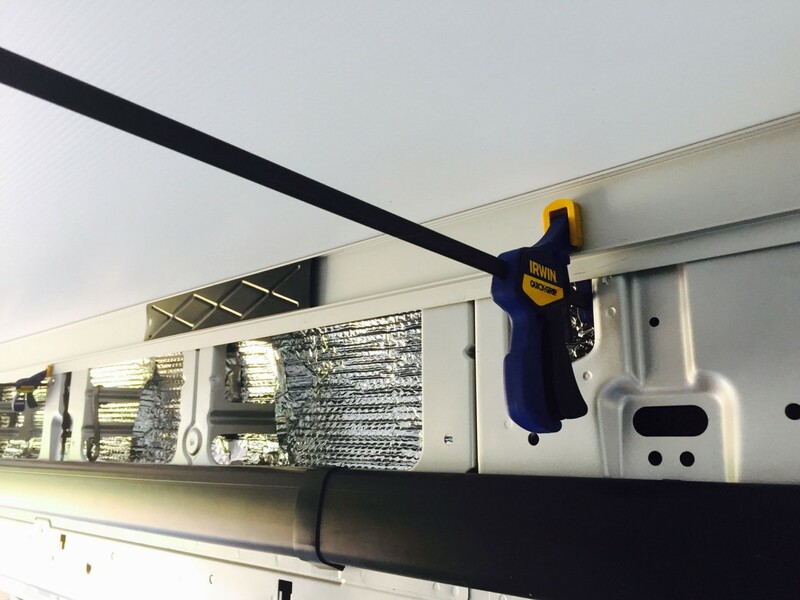 That is another nice feature of Coroplast, it doesn’t weigh enough to need heavy fasteners. Did you use existing holes? What size are the pins? 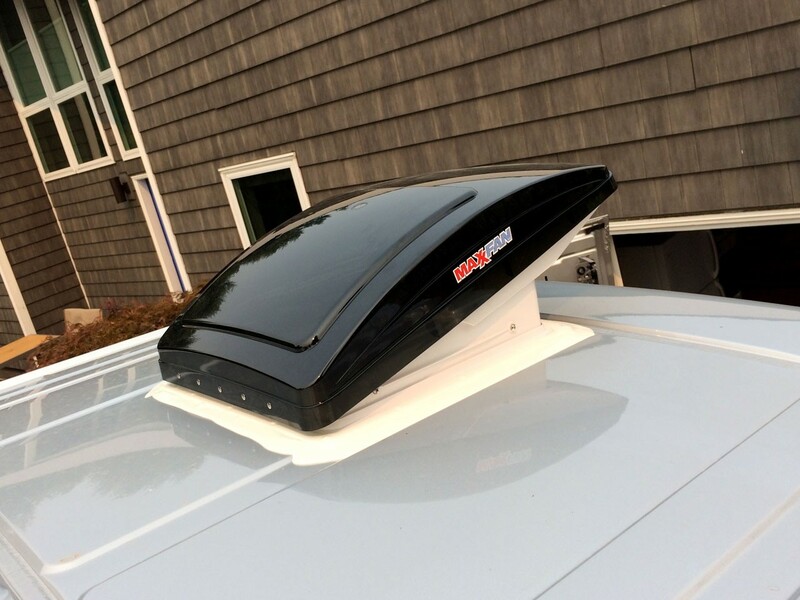 Didn’t know the channels were also available in the other direction… would have been helpful on the roof sections. 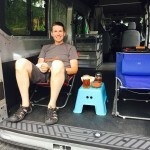 Just starting the van conversion adventure! We will be using many of your great ideas ! Thanks! 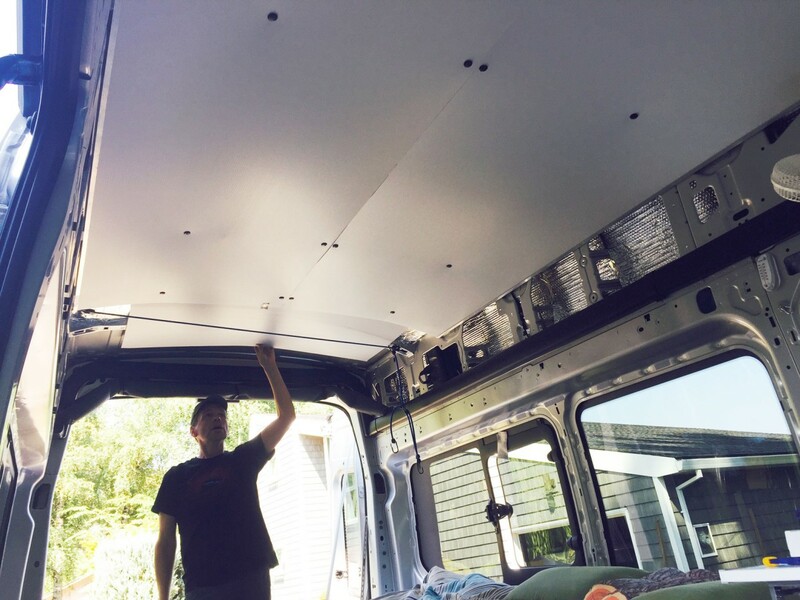 we are using the coroplast for our ceiling, as you did. 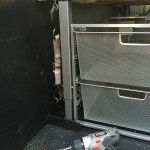 how best to match up the retainer holes to know where to drill holes in the panel?? We ended up doing those one at a time, from the center out, by eye and feel (it’s pretty subtle though). A sharp probe works well to poke through the coroplast and locate the openings (if you miss, it only leaves a tiny hole), then an exacto knife to make a series of radial cuts to define full opening. No need to drill them out perfectly because the clips cover up the opening completely. You have given us so many good ideas. 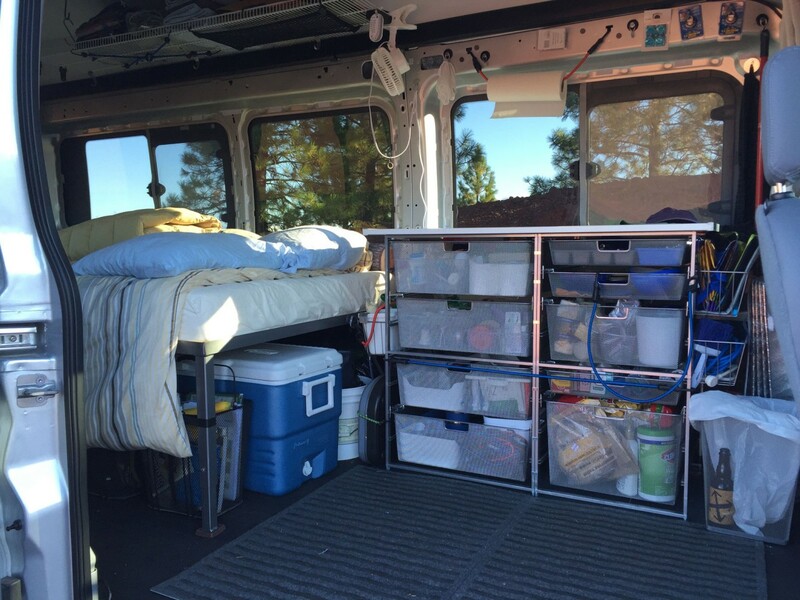 Love your setup, but how do you run your Maxxair fan? We’re getting power from the customer connection point at the base of the driver’s seat. We rarely run the fan, only when it’s really hot outside. The vent is open all the time (apart from when it’s very cold outside or we’re traveling on dusty roads). 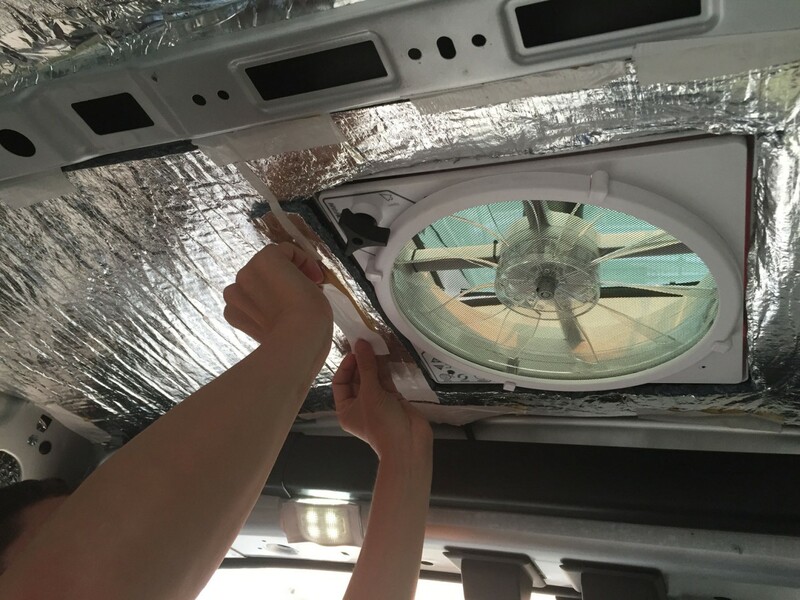 It’s usually about 10 degrees above ambient inside the van. Some great ideas. 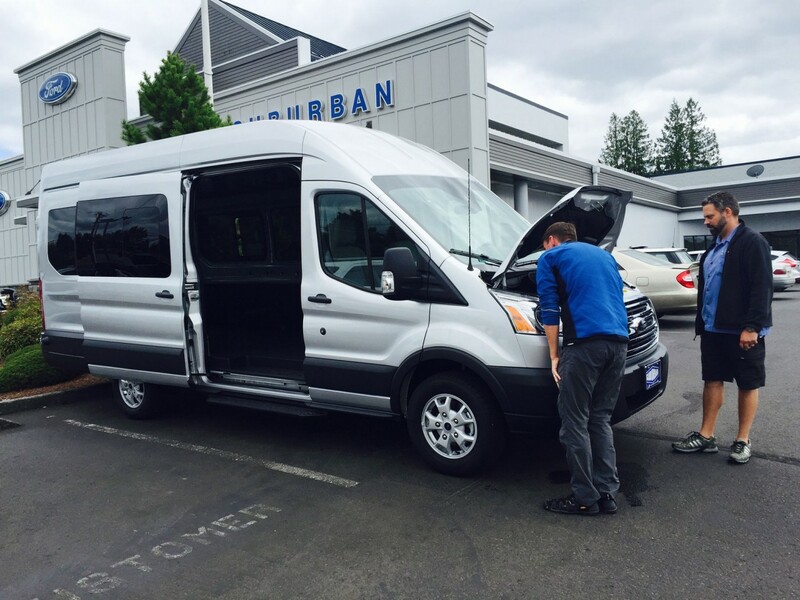 We just moved to Vancouver Washington and we purchased a2015 Toyota Sienna. We use it for sleeping. 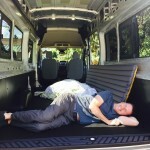 I built removable platforms for the bed and have it kind of set up. 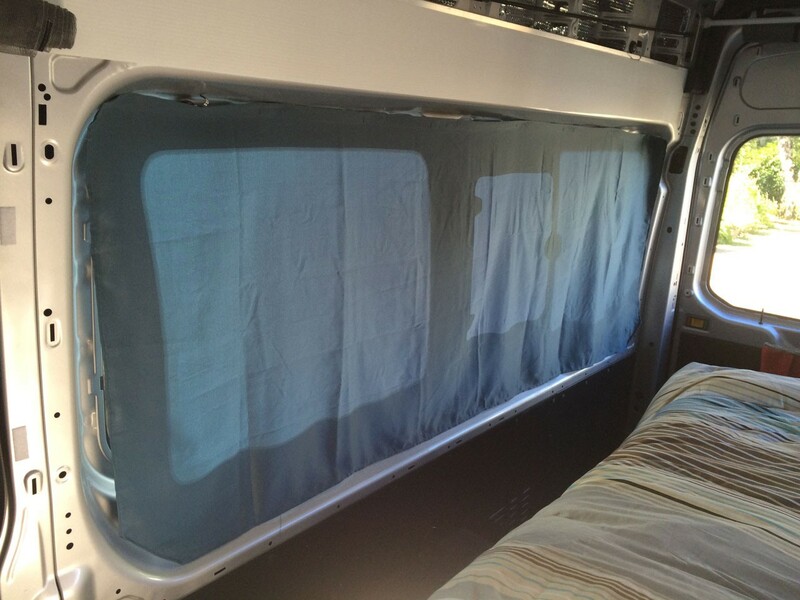 Blocking the windows for privacy at night is the thing I’m researching now. I see a lot of people using Reflectix with black fabric on one side for a stealth look. 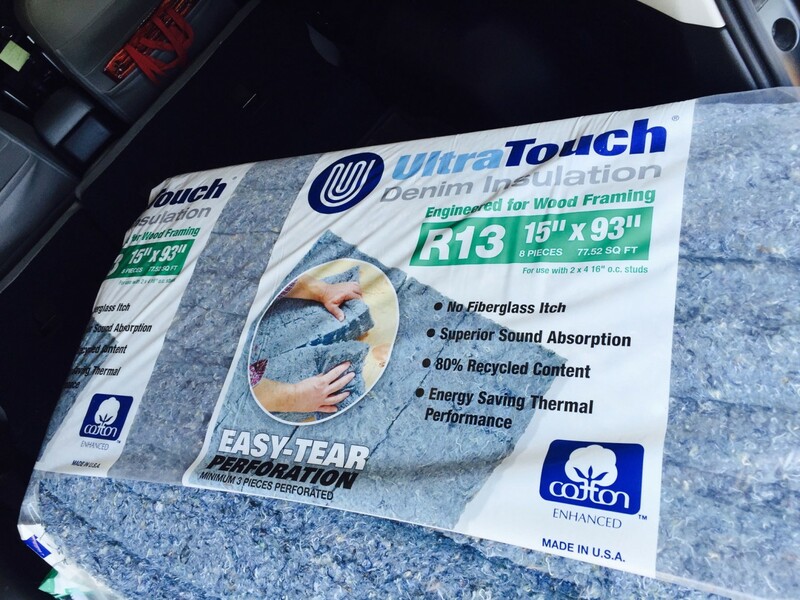 What do you think about the Reflectix for insulation solely for the windows? I’ve heard of people using the Ultra touch as well. My wife is cold most of the time and I love camping in the cold weather when kids are in school. We are both retired. Love to hear your thoughts. 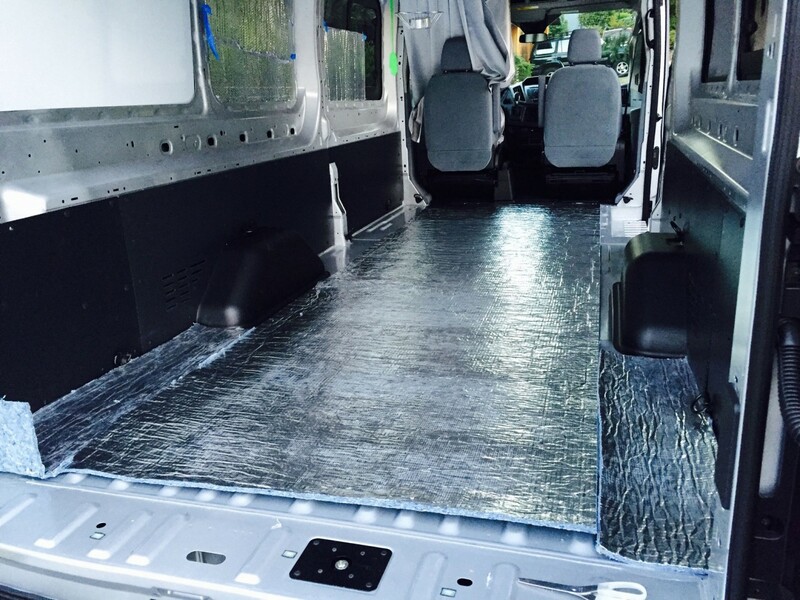 We started out with Reflectix tucked into the window frames of the van. It worked and made a huge difference for both hot and cold temps. The problem, for us, was that it looked a little too unfinished and obvious from the outside. The cloth covers helped tidy up the look. 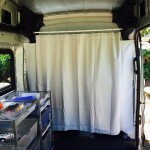 The fabric is a medium gray, wrinkle-free polyester curtain material (matte side out) from Fabric Depot. First, allow me to apologize for posting this here even though it might not fit quite right. I recently came across your blog while doing some research for a QS 8.1. 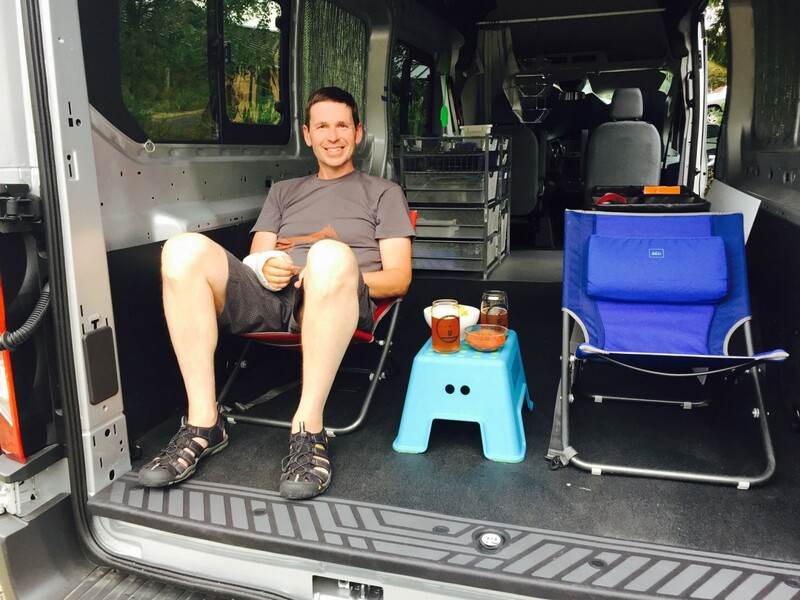 I was floored by the fact that you did all this camping and adventuring with the 8.1 while towing it with a Subaru Forester (non-XT). My wife and I having been thinking about doing the same, but have been unsure about what the tow is like with the 8.1 behind the Forester given the weight (just over 1,000 pounds). Did you ever have any issues with it? 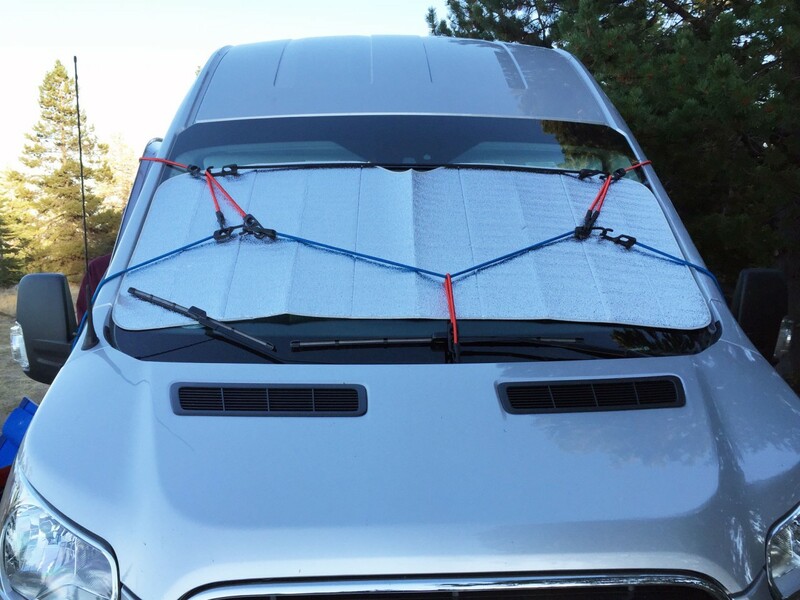 Was the towing sluggish – did it destroy your gas mileage? Any insight you can offer is GREATLY appreciated! Keep the adventure going! Your new setup looks awesome! The Quicksilver was a great little tent camper and we had no trouble towing it with our Forester. The trailer had no brakes and the Subaru wasn’t wired for it in any case, which is why we ended up with the QS. 1. 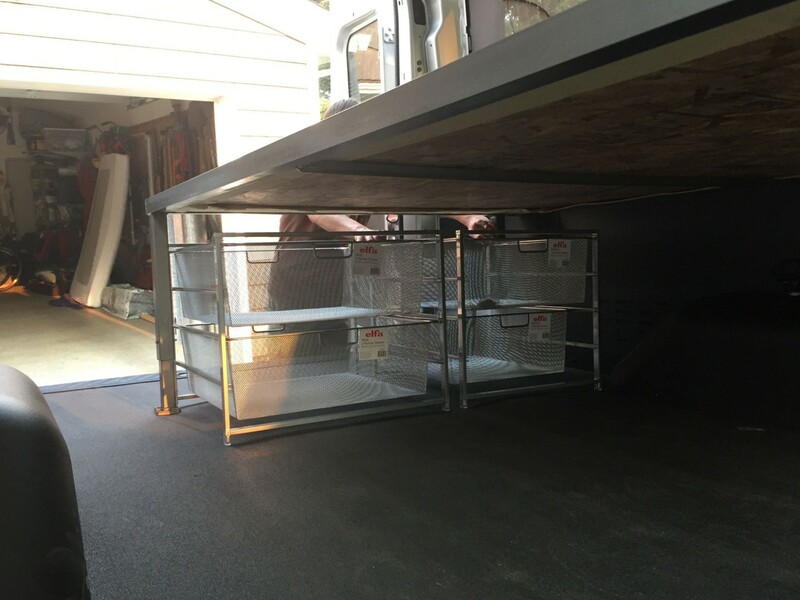 The trailer could only be packed/unpacked while completely open. 2. Rain and wind made setup and breakdown a chore. 3. Towing makes parking and in-city driving much trickier. 4. Leaving the trailer at the campsite inevitably meant leaving something you wanted behind (unintentionally). 5. 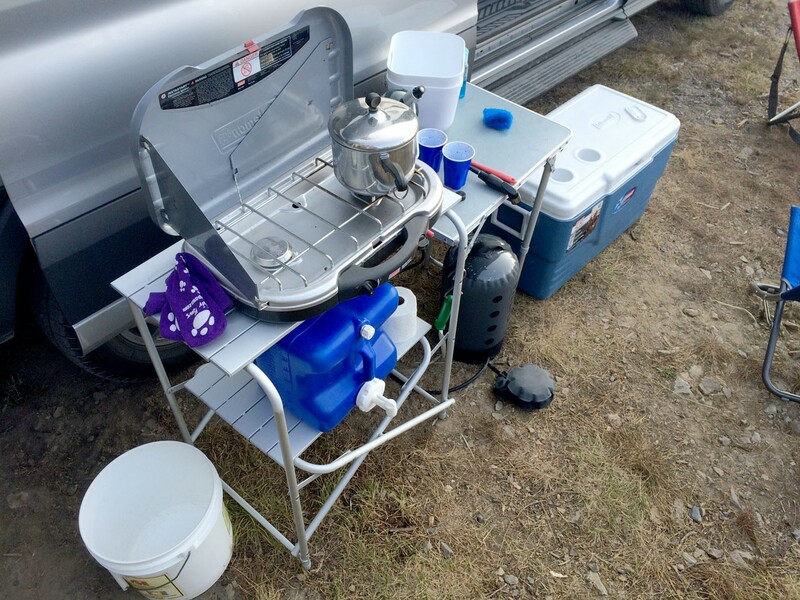 Counter space was VERY limited in the trailer (stove and sink occupy nearly all of it). 6. Tents have a limited comfortable climate range and do little to abate noise. Thank you for following up – it’s greatly appreciated! I look forward to following along with your adventures. I really like your elf a shelving unit. Can you please tell me how you attached it to the van? 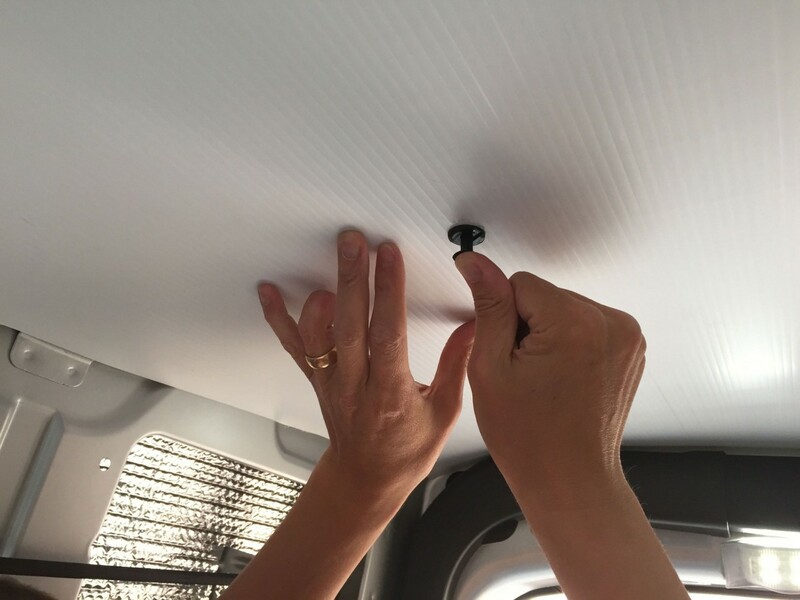 Is there an easy way to attach it to the van wall? Thanks for all the great ideas. 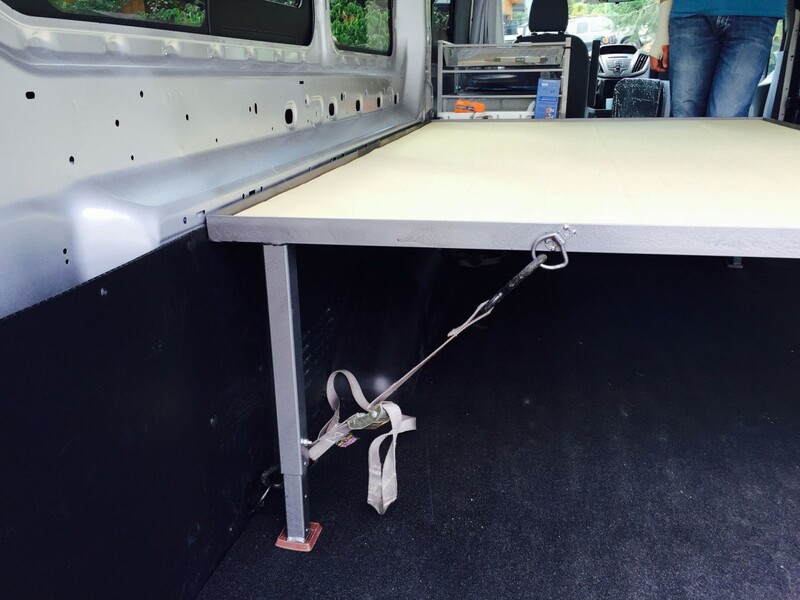 how did you secure the elfa drawer unit to the sides of the van and the floor? 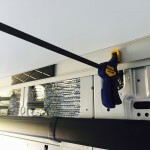 We added eye bolts to the wall near the top and bottom of the elfa, then ran ratchet straps from the eyes, through the back of the metal frame. 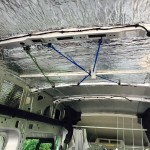 Reinforced with a couple of heavy duty zip ties at each point to minimize stretch of the straps. It’s nothing like bomb-proof, but enough to keep it all in place over rough roads and sharp turns. Makes it simple to remove the whole thing when necessary. 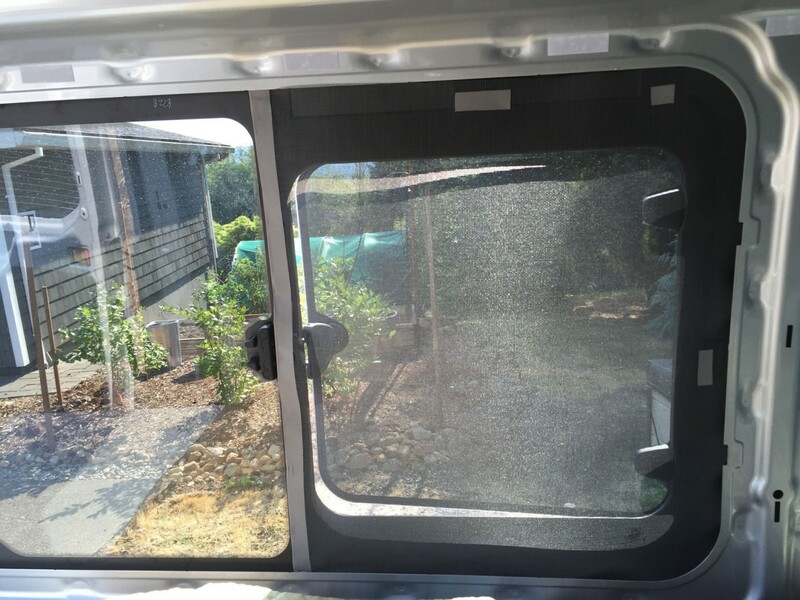 the side slider windows…..from where did you purchase them?? have been looking high and low and can’t seem to find them anywhere. If you are referring to the actual glass windows, those are from the factory and they are the standard pop-out variety, not sliders (I wish an aftermarket firm would make some awning or slider window options, as the pop-outs are delicate and cannot be left open while driving OR in the rain!). On the other hand, if you mean the shades – then we made those ourselves from wrinkle-free fabric with Reflectix sandwiched in-between. Hi, thanks for sharing this simple self build, its a really helpful basis for a conversion and one that I plan to follow closely as I attempt my own over the next few weeks. 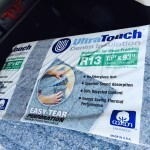 I wonder if you could comment on the moisture retention of you UltraTouch insulation? I live up in Vancouver BC and a little concerned that our Pacific NW humidity will get into the insulation and lead to problems. I see you’ve commented on this once before, but I wonder if there are any developments now that you’re over a year since you did your build? I haven’t seen any evidence of water collecting in the UltraTouch. 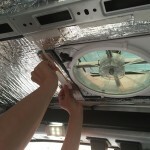 However, we’ve been very careful about introducing humidity inside the van. 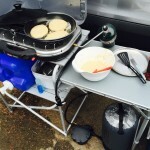 We cook outside unless the weather is uncooperative, then we keep it to a minimum inside. 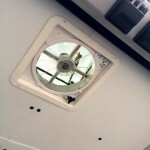 At night, the Maxxaire fan is always open (actually, it’s only ever closed when we drive on dusty roads) with the front windows open an inch or so we don’t get any condensation on the windows. We tried a portable propane heater (Mr. Heat Buddy), but it proved to be VERY humid heat, so we only run it on the very coldest mornings in tandem with the van heater (which works amazingly well on its own, quickly heating the space) and only for a few minutes. If we have access to electricity at a campground or friend’s driveway, a small space heater is more than enough to keep it toasty. If we spent much time camping in the snow zone, I would definitely invest in a Webasto heater. Thanks a lot for getting back to me- It’s hard not to spiral down into internet click holes when researching this stuff and i’m grateful for a personal response! I think in balance I’ll go ahead with the ultratouch, if it does get mouldy or rusty then at least i’ll be replacing it knowing that I’ve tried to avoid the harsher substances! 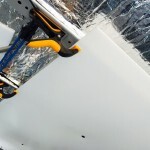 Did you use a vapour barrier over the insulation like many do? 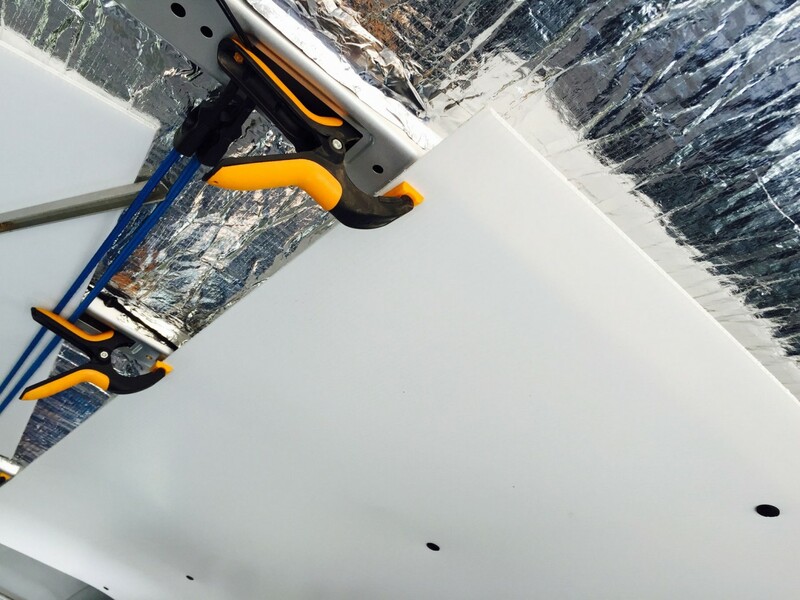 We decided to skip the vapor barrier thinking that it would be more likely to trap moisture… let it breathe! 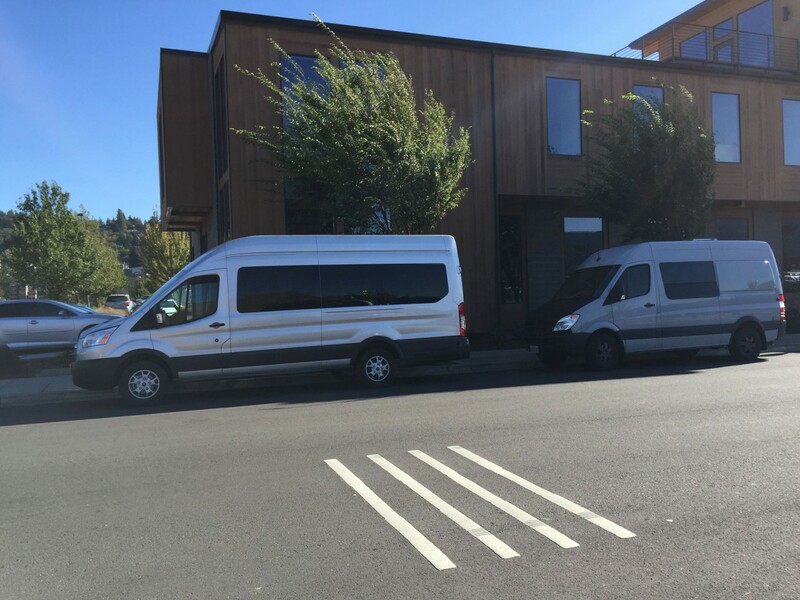 Our van has windows all around with 4 of them openable. 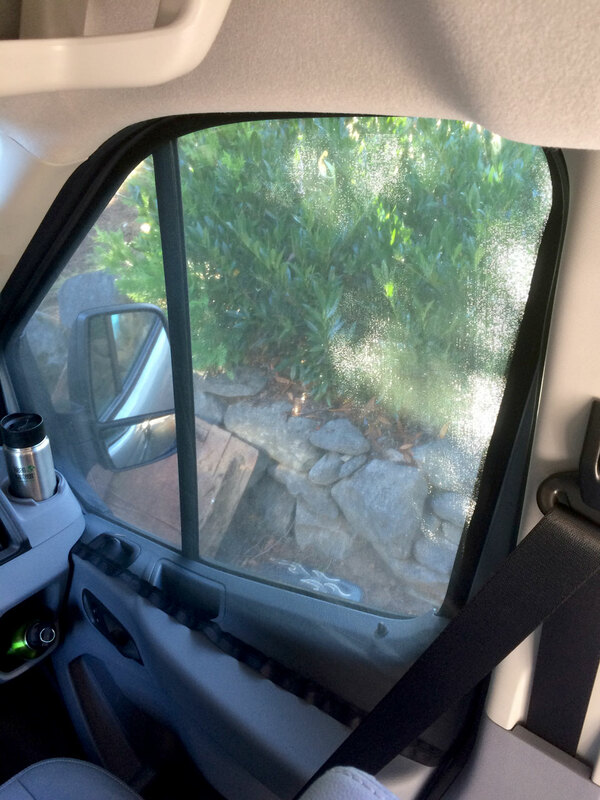 We’ve found that inside temps tend to be 10 degrees warmer than ambient, even with the front windows open an inch and the Maxxair in the open position. 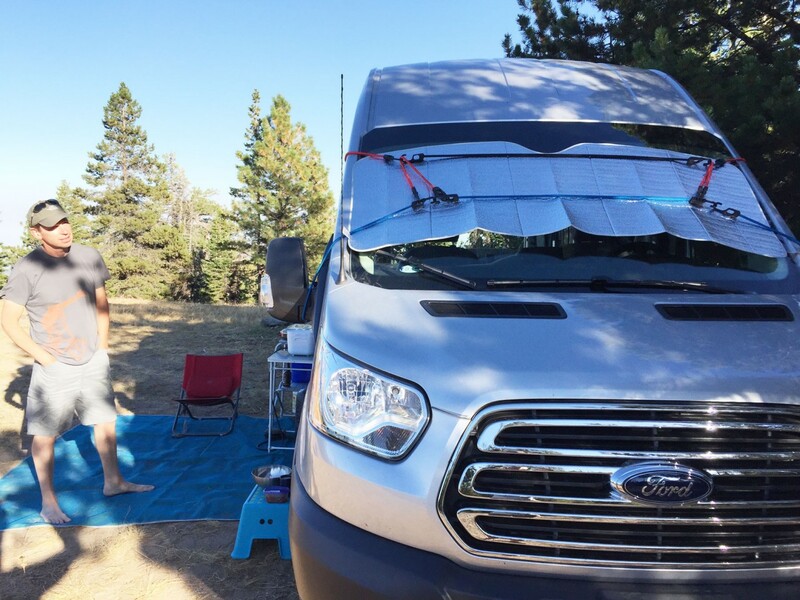 Once the sun hits the van in the morning (we pick our camping spots for solar exposure), it heats up quite nicely on its own. Run the engine with the heat on full (electric assist heating in that position, so it blows heat right away) for 10 minutes and it’s plenty toasty to start the day. 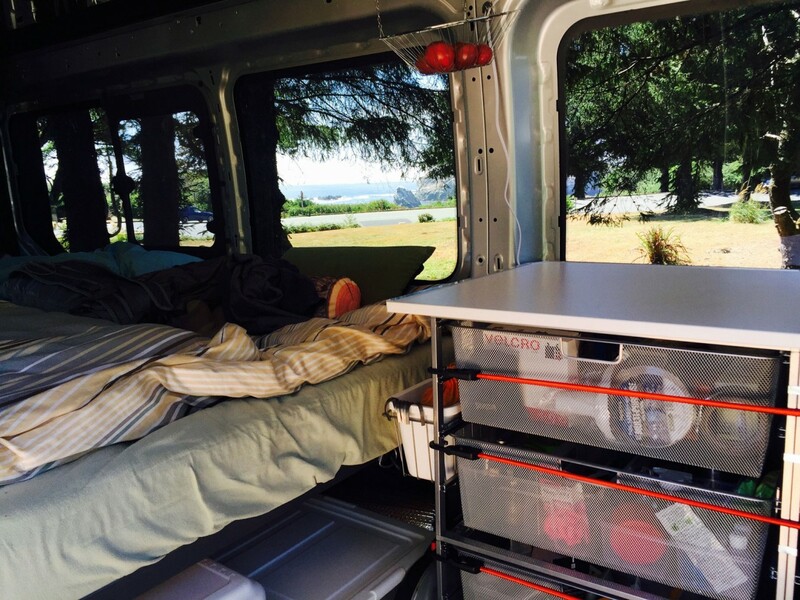 It appears that you have the same basic van which I have and I think I see a photo which shows at least one of your side windows has a slide open portion. 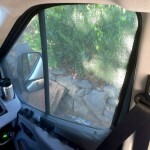 I’ve been trying to find replacements for some of my side windows so that I can open them for ventilation. Where did you get the windows and did you install them yourself? 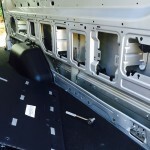 Four of the rear windows are the openable ones from the factory. They just flip out a couple of inches, though, and they aren’t very sturdy (not supposed to drive with them open). We’ve had to replace two of them and likely a third this year. 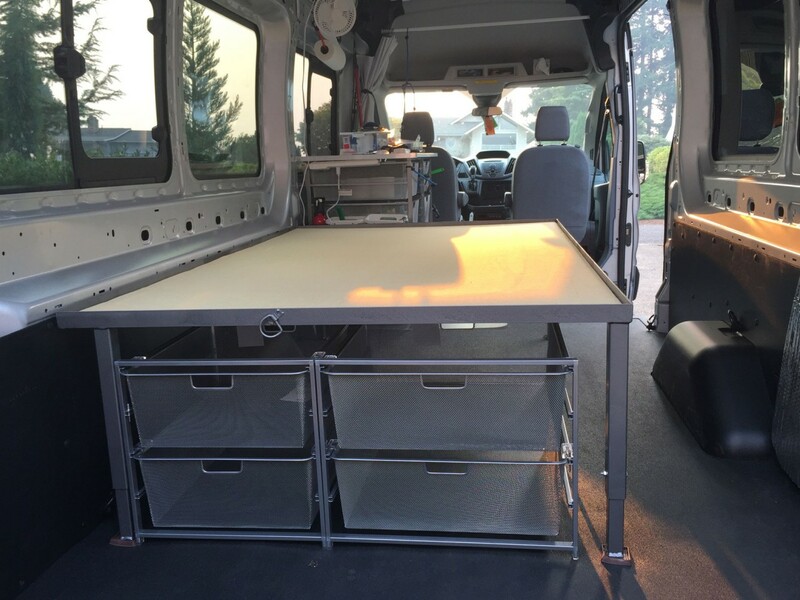 Van Specialties in Portland, OR can install them… or any body shop, I would guess. I was wondering if you found the mattress a little too short? I am the same height but I am thinking of getting the 80″ length. David and Chris Meyer!?! I cannot believe I stumbled across your blog. 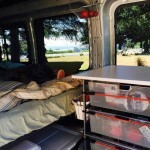 Wow, awesome van conversion love what you guys have done with it. I will never forget all you did for me, education wise, dinners at the house, mentorship… I’m so pleased to have ran across you guys again. 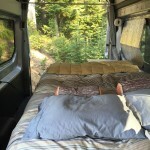 I’ve been dabbling in the van life pretty much since leaving MHCC… looking now to upgrade from an old Chevy G30 to a high top, better gas milage sprinter type van. I’ve only just read this one post but can hardly wait to catch up on all things beyond Third Door. Happy trails to you guys, maybe see you on the open road someday. Hey Chris! Awesome to hear from you after all these years! We retired from MHCC in the fall of 2015 and have never looked back. 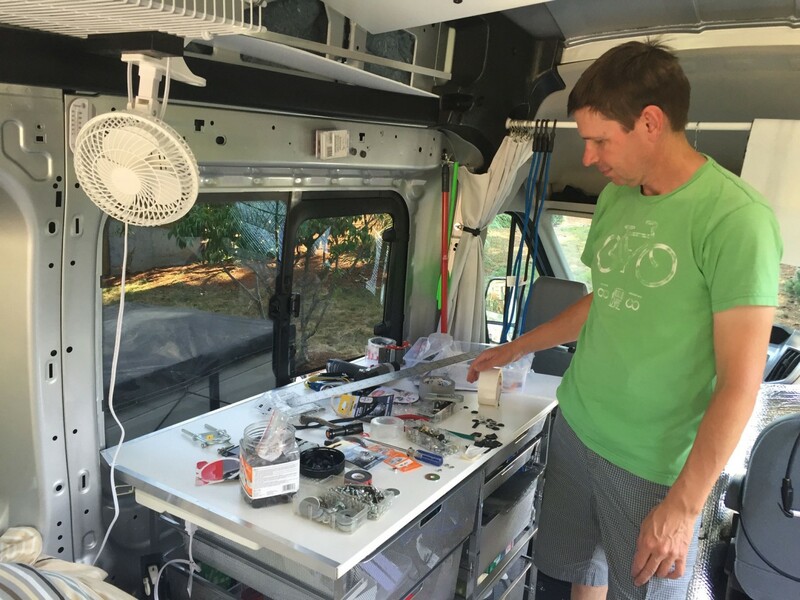 We’re now living in the Redmond area and get back out on the road as much as possible. 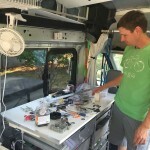 David continues to make tweaks to the van which has been fun. 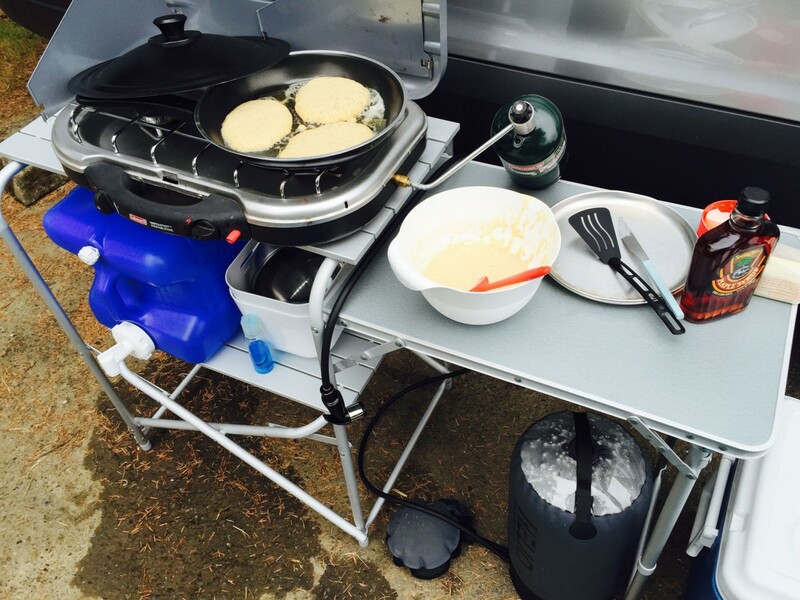 We’re so glad that we kept it DIY and simple as our needs have evolved with each trip. 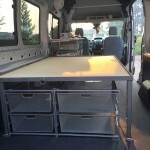 I have started looking for used ford transit 250’s. But it appears there are none available with the medium roof. 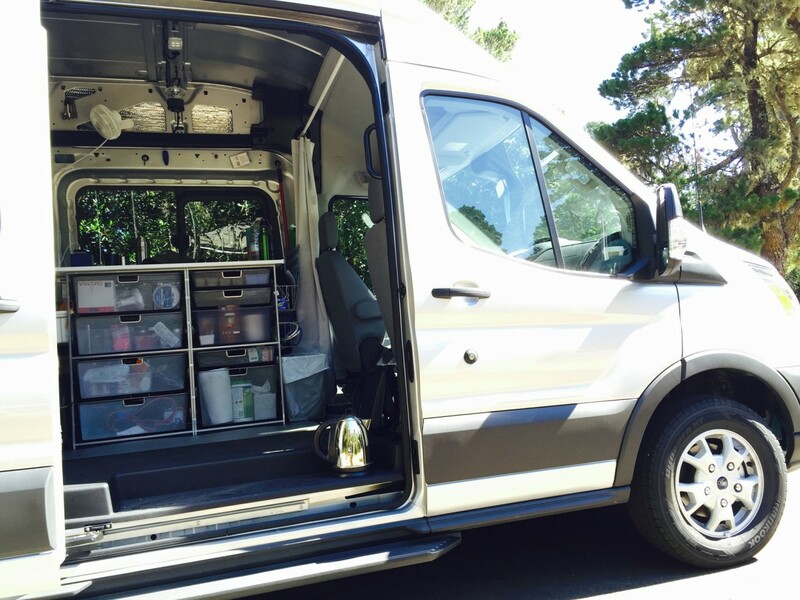 do you have any tips on finding a used ford transit? Lots of knowledgable people there, maybe even get you a good deal on a new one. CrewVanManInfo is really connected to the Ford Transit pipeline. I have more specifics in the comments above. No more details really. I wouldn’t say that my method was the best, but it worked for us! I just found your site and noticed it was from 2015. After this time would you mind telling me if the way you did your roof was still a good choice. I think it sounds great, and want to do it. Did the insulation get wet? 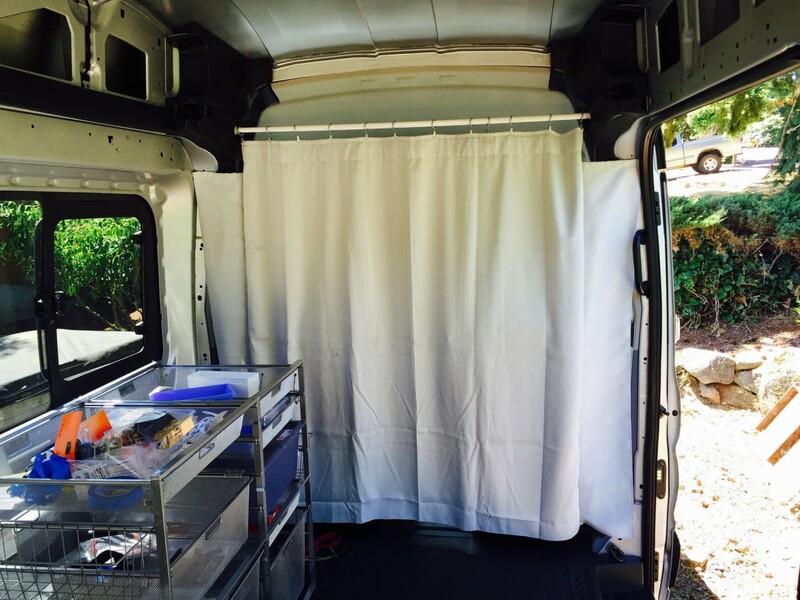 Hi Toby – We didn’t have trouble with the insulation getting wet, but we’ve also been careful to keep good ventilation going inside (front windows cracked, vent open most of the time camping). 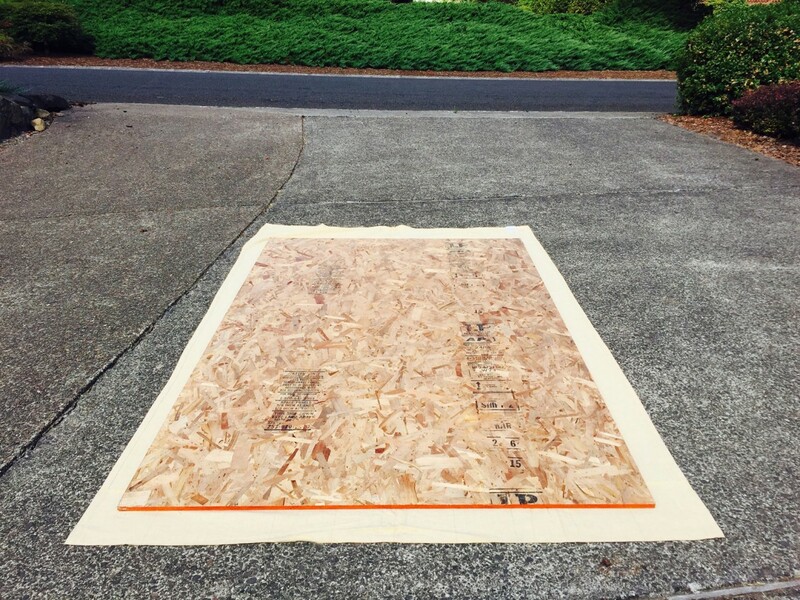 Coroplast held up well and was easy to cut and attach to the roof. In hind-sight, it would have been simpler to use wood strips along the roof, rather than trying to use the existing trim holes in the ribs. Good luck with your van! !